Here is the option in Keynote ( under Keynote: Preferences: General) to scale images when you import them. 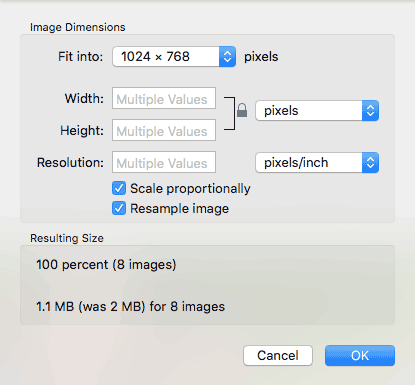 Unfortunately even when this option is checked Keynote doesn’t scale small images up. It just places a small image in the middle of the keynote slide. You then need to manually go into Keynote and make the slide bigger by dragging it. A much better way to bulk scale images up or down so that they are the right size for your keynote presentation is to use Apple’s Preview application. You can take an entire folder of images, drag it onto preview, scale all the images to the right size automatically, and then export them all ready for your keynote presentation. Here is how to do it. Open all the images in Apple Preview. Select all the pictures and open them in Preview. I do this by using shift-click to select all the filenames and then use my right-click on my mouse and choose ‘Open With’ Preview. There are other ways to do this. For example you could drag the folder of pictures onto the preview icon in your dock. 2. Select all the images. 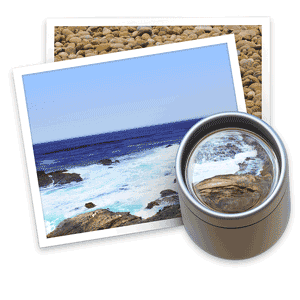 Go into the Thumbnail view and select all the pictures (Apple – A). You may need to turn on the thumbnail view under “View”, “Show thumbnails”. 3. Adjust all the images. Select the size of the keynote slide that you want. Preview will scale the images to be as big as they possibly can and still fit fully within this size without cropping them. Here I have chosen 1024 x 768. 4. Save all the images. You need to save the images but do not choose “Save” or you will have to click okay for every single image to confirm the save. 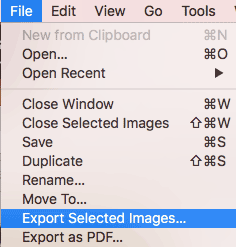 Instead choose “Export selected images”. This will bulk export all the images in one go. The images will still be separate files. Now you can now drag all those images into Keynote and they will be the exact size that you need them to be.